The Advanced class is for the basic hand gunner who wishes to learn the use of the defensive pistol in practical situations. Tips from the most renowned defensive trainers and schools in the US will be discussed. Concepts and techniques specific to various environments are to be personalized and incorporated into each student's further practice. The class is held on Saturdays during the summer months. Call in advance for information regarding the purchase of holsters and ammunition. Bring a comfortable strong side holster, inside or outside the waistband, that covers the trigger guard, allows one handed re-holstering, is easily concealed, and secure holding with or preferably without a retention strap. Students must have a permit to carry or have completed a basic pistol course, have a primary carry gun, acceptable holster, 150 rounds of ammunition, and will be expected to carry their weapons concealed on the range. Part 1: Defensive situations and mindset will be discussed so each can develop plans of action. Methods of safe weapon carry, ambidextrous presentation, and one handed re-holstering will be practiced. Part 2: Basic weapon deployments will stress safety. Part 3: Shooters will shoot concealment, cover, and movement exercises. It is our hope that this training will benefit those with all levels of handgun experience. Defensive use employs technique and mindset very different from military, law enforcement, hunting, or competition. The goal of the advanced class is to help each member achieve the skill, confidence, and comfort to carry, so he or she can safely protect themselves and their loved ones. After trying different techniques, practice that which is most comfortable and successful, then build on it. Our skills come from a series of building blocks that we assemble with the flexibility to suit our immediate needs. We may need to adapt our techniques to fast changing situations. Ideally, we should be able to use the sights if our situational awareness gives us enough time and distance. Movement off the line of force, to cover, to concealment, to confuse, is my #1 priority. I teach movement and draw simultaneously after each has been practiced separately. The least difficult case, and perhaps the most commonly encountered, will allow a verbal warning, a two hand isosceles hold, controlled breathing, and sights lined up on COM. This is what we will practice first at 15 yards. The most difficult case may be a sudden threat from 3 to 6 feet coming from an angle other than 12 o’clock. This is what we practice next as we incorporate a draw with movement and one handed “point shooting” from close to the body and, if possible, centered with the body. So called “retention” shooting has proved unsatisfactory unless one leans the weak side towards the threat to improve the wrist angle and aid natural pointing instinct. Finally we practice from each end of the easy-difficult spectrum until we reach the “should I point or use two hands and the sights?” transition from both ends of the spectrum. Then we put that together with the lateral blast off the line of force to cover. From the least to the most difficult scenario there exists a continuous technique that transitions from point to sighted shooting, as Jim Lynch pointed out. I practice both, knowing that I will use the most effective for the situation. If I have time for a two hand hold, I’ll be looking down both sights as if my life depended on them. If I’m diving for cover as I draw, a one hand hold will be used for a point shot within my range. Jelly Bryce once entered a room, saw BG on the couch with a shotgun pointed at him. Bryce moved to dodge the blast as he drew his .357 and point shot to end BG’s career. 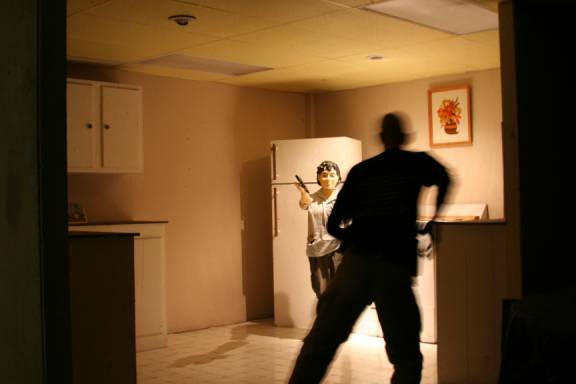 The odds are that you will be up against a street robber or a home invader. Here are a collection of posts by a street veteran that describe your enemy. As a veteran Police Instructor of over 34 years, I will tell you that waiting for 911 to respond will "get you dead" most of the time. Violent criminals who attack you are going to take you out prior to the police arrival. WE have what we call the 3-3-3 Theory... The criminal event will occur within 3-yards of you, be completely over and done with in 3-seconds and the winner will get in 3-shots, stabs, punches, etc... Then there is the 30%, 70% Theory which states that 30% of the time if you shoot a person in their vital areas (torso) they will go down to the ground within 3-seconds. The major problem here is that the average human being can run an average of 45-feet within 2.2 seconds... Which says that if they attacker has a knife, you are about 100% likely to recieve its razors edge prior to the culprit going down... 70% of the time if you shoot a double tap into the bad guys chest, they will continue to do what it is they were doing when you shot them, because it was a through and through shot and hit no vital sources... As a Police veteran, I have seen this occurance more times than I want to recall... Also, remember that the Hollywood image of shooting a person and them careening backwards and guts exploding out the front is totally (falsehood). A person who is in perpetual motion, with forward intertia is going to continue with that forward intertia until you do something that will cause them to drop dead... Keep shooting until the deadly situation is over and done with. The first step of response to any attack has got to be the recognition of that attack. From that instant, the race is on to respond as efficiently as possible to end the attack and survive. When the attack is a charging or armed person that justifies a lethal response, the time it takes to draw, present and fire your pistol could become an eternity if you don’t do something else to disrupt the incoming attack. In some cases, you may be close enough to physically interfere with the attack, trapping a knife, blocking a strike or grapple attempt or moving the muzzle of a gun offline. These situations are dealt with in Valhalla’s Extreme Close Quarters Tactics courses. In most other situations, the best (and maybe only) thing that you can do is move offline from the attack. This Lateral Movement could save your life, and will certainly make you a harder target to injure. The concept of lateral movement is not to create distance, per se. The idea is to shift your body 90 degrees offline from the attack, causing your threat to have to shift his movement and/or aim in order to hit you. While this is a very simple concept, it is often overlooked during both square range and force-on-force training. The mantra of “create distance” has been repeated so often, that many have overlooked the fact that moving backwards really does nothing to affect the likelihood of someone hitting you with a firearm at realistic ranges, nor does backward movement outpace a charging opponent under most circumstances. Integrating a rapid shift of your body to the right or left while drawing your firearm during square range training, force-on-force activities or even competitive shooting will help to ingrain this potentially life-saving response so that it occurs more efficiently during a critical incident. This is one of the fundamentals of an efficient armed response, adapt it to the context of your environment and train it as often as you can!